Lavadome Records has set June 5th as the date on which CHAOS INCEPTION‘s The Abrogation will be released. Final artwork for the album can be viewed below. It was created by Italian painter Paolo Girardi (artist Facebook page) and it depicts a vision relating to the last days of humanity in connection with the musical side of the album. On the Alabama act’s sophomore effort CHAOS INCEPTION continue to push that Floridian/Brazilian Death Metal paradigm even further into its own identifiable realm of extremity, while remaining heavily rooted in the traditional conception. The Abrogation was recorded and mixed by Lance Wright at Stargate Studios in Huntsville, AL during Fall/Winter 2011 and mastered by Brian Elliot at Mana Studios in January 2012. 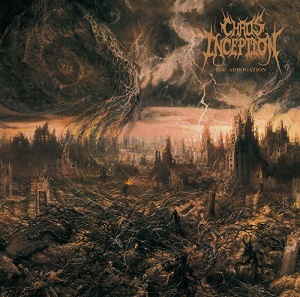 CHAOS INCEPTION‘s Legacy of Extreme Death Metal Art continues and the Hellfire blasts will be unrelenting. Submit to incineration! Listen to The Abrogation title track and “Phalanx (The Tip of the Spear)” at this location. It matters not whether you’re a fan of Morbid Angel, Krisiun, Hate Eternal, Origin, Deeds Of Flesh, Behemoth, Job For A Cowboy, Angelcorpse, Necrophagist or Gorgasm, as The Abrogation will satisfy those searching for devastating, skilled, extreme, and compositionally expressive music coming straight from the soul whose main driving force is pure sincere creativity. Chaos Inception are well on their way and The Abrogation is here to prove it’s all possible. The nine tracks on the album are a real tornado; unbridled yet completely controlled, showing that the legacy of the Floridian/Brazilian style of death metal is still alive and ready to be pursued on. The dedication, chemistry, experience and skill are traits present within the ranks of Chaos Inception. And it all got even more expansive and refined since the release of their debut album in 2009. The new material sounds even more focused, intense and musically proficient. The legacy of the progenitors of the style is still there, unquestionably. However, the band’s guitarist and main songwriter, Matt Barnes, successfully creates a style of his own. It’s the respect and understanding of the roots of the genre that is needed in order to push the borders of the music to unseen horizons, which were so close yet so distant. There is still a lot hidden behind the almost inhuman shredding and compositional mastery. The details hidden in arrangements and riffs appear and take the musical extremity on the album to yet another level. It needs to be said that all members of the band delivered top-notch efforts on the album and it couldn’t be what it is without their performances, be it the overwhelming crescendo of Gary White’s drumming artillery; the incredibly varied, rhythmically tight phrasing of the vocalist, Chris White, and last but not least, the bass guitar patterns by Cam Pinkerton giving all the tracks a firm floor while expanding and bringing a steel-pulsing, skull-crushing edge to the table. Every one of these elements adds to the thrilling, lightning and burning imagery erupting from the sounds of the album. Although the album clocks in at around half an hour, time becomes absolutely relative because with a close, concentrated listen one enters something that we call death metal eternity; it reveals the enormous effort put into every detail of every single note and one song could feel like if it were lasting for eons and still remain exciting- a sign of real, time-defying art in its purest form and that’s what The Abrogation by Chaos Inception is all about. Lavadome is proud to serve as a medium and carry this masterpiece to the public worldwide. We are even more stoked about this album because being long time, dedicated fans of extreme death metal, we know that albums like The Abrogation aren’t released every day, but rather just few times per a decade and this has already been a long wait! Enjoy this pure detonation of extreme death metal! was recorded and mixed by Lance Wright at Stargate Studios in Huntsville, AL during Fall/Winter 2011 and mastered by Brian Elliot at Mana Studios in January 2012. Other bands in which Chaos Inception members participate include Monstrosity (Matt Barnes) or Blood Stained Dusk (Chris White). Gary White used to play in Convergence From Within.